The three families agreed to hold a joint funeral in Modiin, Tuesday afternoon at 5:30 p.m. 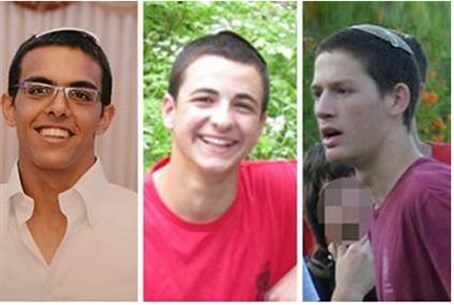 The families of murdered yeshiva boys Naftali Frenkel, Gilad Sha'ar and Eyal Yifrah have agreed to hold bury the three side by side in Modiin. Each boy's funeral will begin at the community in which he lived. All three communities are within a 15-km radius of Modiin. The funeral of Eyal Yifrah Hy”d will begin at 3:30 p.m., at the Mishkenot Neria synagogue on 24 Pinhas Ben Yair street, in Elad. The funeral of Naftali Frenkel Hy”d will begin at 4:00 p.m., at the synagogue in Nof Ayalon. The funeral of Gilad Sha'ar Hy”d will begin at 3:30 at the central synagogue in the community of Talmon. At 5:30, the funerals will merge when the boys are buried side by side in the cemetery at Modiin. Authorities have just announced, as of 10 am Tuesday, that the official legal and halakhic identification of the bodies of Frenkel (16), Sha'ar (16), and Yifrah (19) has been completed. Officials stated that while the bodies found Monday evening were assumed immediately by those at the scene to be those of the abducted teens, the official, thorough confirmation process took several hours. An IDF source told Arutz Sheva Tuesday that shots could be heard in the recording of the boys' fateful call to police hotline 100, shortly after one of the teens whispered "we've been kidnapped!" The source also laid out a basic timeline of events. After the boys entered the vehicle at the Alon Shvut intersection at Gush Etzion, the vehicle traveled west, then made a U-turn toward Hevron. Shortly after, one of the boys called police, and the shots were fired. The abductors apparently realized that police had been alerted and assumed that they would shortly be tracked down. They may therefore have decided on the spot to murder the boys and get away as fast as they could. They had no way of knowing that the emergency call had been mishandled by police, and that the search for the boys would not begin until eight hours later. On Friday morning, the car where the abduction occurred was found near the Palestinian Arab settlement of Dura, along with a rifle and ammunition casings. While maintaining that the boys are considered to be alive until proved to be otherwise, security forces have in fact been aware that the most likely possibility is that the abduction went wrong, with the terrorists murdering the boys sometime late Thursday night, June 12, or early on the 13th. This is indeed what happened. The boys were then buried in a shallow grave near Halhul sometime before Friday morning.